The German giant has continued on its growth path in the third quarter of 2014. From July to September, the revenue increased 10.6% to €618.3m. Year on year, operating income (EBIT) went up 19.3% to €30.0m. This positive development was supported by both business segments, it says. "In the third quarter, we successfully followed up on the first half of the year, which had already been excellent. We have reason to be more than satisfied with our double-digit revenue and earnings increase. Our growth continued to be broadly supported by both business segments. 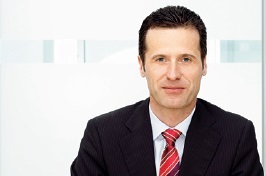 We are also delighted with the further growth of our team and the high training ratio of about 9% in Germany," says Dr. Thomas Olemotz (below), Chairman of the Executive Board of Bechtle AG. The IT system house & managed services segment increased its revenue 9.2% to €420.6m (prior year: €385.0m). “The performance of our foreign system houses, which were able to boost their revenue share by 19.9% from €36.9m to €44.2m, was especially noteworthy. In Germany, the revenue amounted to €376.3m, an increase of 8.1% (prior year: €348.2m). In the third quarter of 2014, the segment operating income increased 14.8% to €19.6m (prior year: €17.0m). The EBIT margin amounted to 4.6%, compared to 4.4% in the prior year. In the reporting period, the revenue in the IT e-commerce segment improved 13.8% from €173.8m to €197.7m. The increase of the foreign e-commerce companies was especially high. They boosted their revenues by 16.1% to €135.0m (prior year: 116.2m). The increase was distributed over all international markets of the Bechtle Group, it says while domestic revenues climbed 9.1% to €62.8m. Year on year, EBIT increased 28.7% to €10.5m. The margin went up from 4.7% to 5.3%. As of 30 September, cash and cash equivalents amounted to a comfortable €118.7m. On this basis, Bechtle can easily pre-finance large projects and realise potential acquisitions. The equity ratio improved from 55.1% to 59.4%. The extrapolated return on equity also reached an excellent value of 14.5%. As of the reporting date 30 September 2014, the Bechtle Group had a total of 6,534 employees (including 476 trainees), a year-on-year increase of 384. The increase of 6.2% is the result of new recruitment as well as acquisitions. “We are confident that our revenue and earnings position will outperform the prior year in the fourth quarter as well. However, we expect the dynamics to be weaker than in the preceding nine months. Thus, we can now be more specific about our original forecast for the year as a whole in that we continue to anticipate a significant revenue increase and substantial earnings growth for 2014. "Thanks to an excellent team performance, we are set to achieve new record figures in 2014. Now, our main challenge is to perpetuate this success next year," says Dr. Olemotz.